A few weeks ago, I was in Jakarta – hot, humid, heaving Jakarta. I hadn’t been there for a decade and in that time it had grown up – literally: towering shopping malls and office buildings, glittering apartments and unbelievably bad traffic. However, somethings hadn’t changed – great street food and truly terrible footpaths which making walking about quite the adventure. I didn’t have time to travel further on this short trip, so had to save the tantalising outing for a walk up one of Java’s incredible volcanoes for another time. However, from the towering hotel, I did spot an expanse of green and quiet tucked in behind the crazy modern thoroughfares and headed out at the first opportunity. 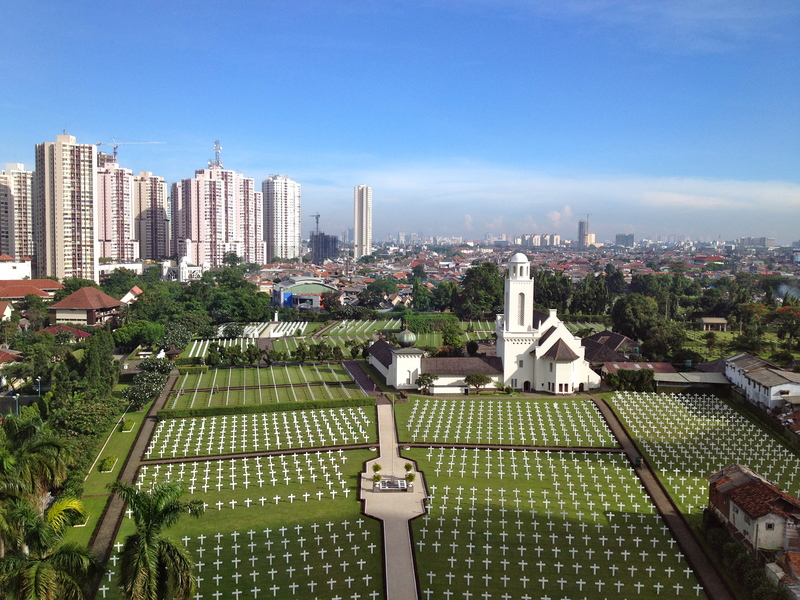 Following my nose through increasingly tiny streets and laneways, I found myself at a ramshackle local graveyard, surrounded by flowerstalls and hawkers, which backed onto the Jakarta War Cemetery and Netherlands Field of Honour. Hundreds of expatriate men and even some women were executed on this site by the Japanese in WWII, and there are graves from a wide group of the Commonwealth nations – including Canada, UK, Australia, New Zealand, India, Pakistan, Bangladesh and Nepal, as well as over 2000 Dutch. It’s a solemn but very peaceful place, with beautifully tended gardens and a still heart which safeguards the memory of those who died so tragically, providing pause for reflection in the heart of a rambunctious, resolutely modern city.